Billing and Inventory Management Software is complete and integrated accounting software for your Business Firm to fully control and manage business functional modules including expenses & income details, inventory and invoicing system, inventory details etc in real time. Software is fully capable to accommodate complex billing and inventory management needs of today’s professional service firms without requiring manual paper-pen entry. Easy to use bookkeeping tool maintains customer-vendor records, item details, store details and other information related to company products. One of the professional accounting software allows users to create reports (accounts, stock, sales-purchase and production), voucher entries with complete password protection facility that can be changed or managed by the administrator. Financial accounting utility facilitate user by giving the provision to generate income and expenditure reports of the incurred data in detailed format for future reference. Accounting tool helps user to maintain inventory (stock) details of multiple companies at one place. Software is capable to prepare accurate accounting reports related to sales and purchase, income and expenses that can be viewed date wise or month wise as required. 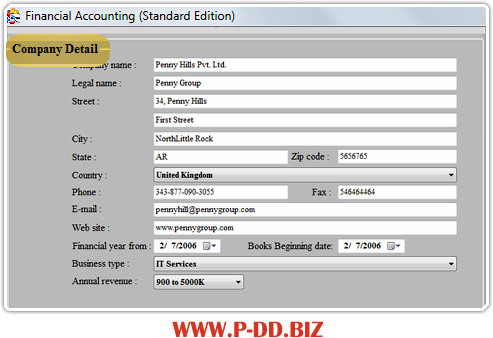 Simple to use accounting utility facilitates administrator to create and modify new or existing company details. Facilitates to export reports in PDF or Excel file formats. Software is password protected and prevents unauthorized access of accounting details by any unauthorized users. Database records can be easily fetched from other machines connected over LAN network. Data Backup and Restoration facilitates users to get data back if lost due to some data loss reasons. No specific accounting knowledge is required to understand software features.